Symptoms of a bunion include irritated skin, sensitivity to touch, and pain when walking or running. Since the bunion may grow so prominent as to affect the shape of the foot, shoes may no longer fit properly, and blisters may form at the site of friction and pressure. Bunions may grow so large that an individual must wear shoes that are a larger size than they would otherwise wear. If the bunion becomes a severe case, walking may become difficult. 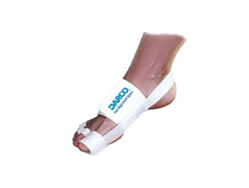 There is a wide rage of treatment options for those who suffer from bunions. If the bunion is mild and does not require bunion surgery, resting the foot and avoiding excessive exercise or walking will help. Wearing shoes that have a wider toe opening, including sandals, can relieve the rubbing and irritation that comes along with more confining shoes. High-heeled shoes should be avoided as they push the big toe outward and can inflame the joint of a bunion. Anti-inflammatory medications (aspirin, ibuprofen, etc.) usually ease inflammation and target pain as well. If the bunion does become inflamed and irritated, application of an ice pack can reduce swelling and pain. If the inflammation because excessive, cortisone can be injected at the site of the bunion to reduce the swelling at the joint of the big toe. Surgery should only be considered for bunions that are painful, not for correction of the cosmetic appearance! The primary indication for operative intervention should be pain that is not relieved by appropriate non-operative management. Although symptom-free bunions can slowly increase in size over time surgical treatment is not recommended unless significant pain symptoms develop. The prolonged recovery time associated with most bunion operations, combined with the potential for complications means that patients should be extremely cautious of undergoing bunion surgery for purely cosmetic reasons.